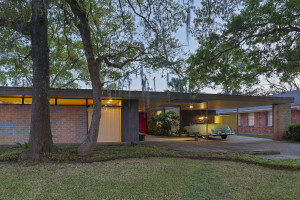 Austin, Texas — Preservation Texas, Inc. has announced that the restoration of the midcentury modern Bendit House, built in 1953 in Houston, Texas, will receive a 2016 Honor Award on February 18, 2016. The Honor Award will be presented at a special ceremony at the historic State Theatre on Congress Avenue in Austin as part of the Preservation Texas 2016 Summit. Designed by architect Lars Bang in the Ayrshire subdivision (4111 Drummond Street) and heralded at the time by national media, the Bendit House was gradually forgotten as the single-story houses that surrounded it were replaced by large-scale buildings. The Bendit House was also insensitively modified, obscuring much of its original conceptual clarity. For the restoration project, a complete roof replacement allowed for improved efficiency while respecting the original skylights and detailing. Masonry was cleaned and repaired in place and exterior siding was restored or replicated. Non-original materials were removed, original paneling was stripped of later paint and restored with appropriate tinted stain. Period-correct fixtures and hardware were installed to replace lost originals. The project team included owners Martha and Steve Curry and Curry Boudreaux Architects.